When UNH media services passed along an inquiry from the British production company TwoFour Broadcast regarding the USS Albacore, current and former members of the ME Department went the extra mile to help out. TwoFour was going to be filming at the USS Albacore in Portsmouth, and wanted somebody to help explain the hydrodynamics and set up a model demonstration. Oh, and they will be here next week. “Clearly, ‘next week’ was going to be a bit tight in light of the fact that we didn’t just have a scale model of the Albacore sitting around for this purpose.” said M.E. associate professor Martin Wosnik. “But I have always been intrigued by submarines so I started asking around.” (ME IT/technologist) Sheldon Parent remembered that (retired ME Instructor) Gerry Sedor was involved with Albacore Park. Sedor put Wosnik in touch with Ken Herrick, a board member at Albacore Park who worked on the USS Albacore at Portsmouth Naval Shipyard in the late 1950s and early 60s. “The submarines that were in service in WWI and WWII were essentially based on surface ships – they were designed to move fast on the surface but were very slow and easy targets under water” explains Wosnik. 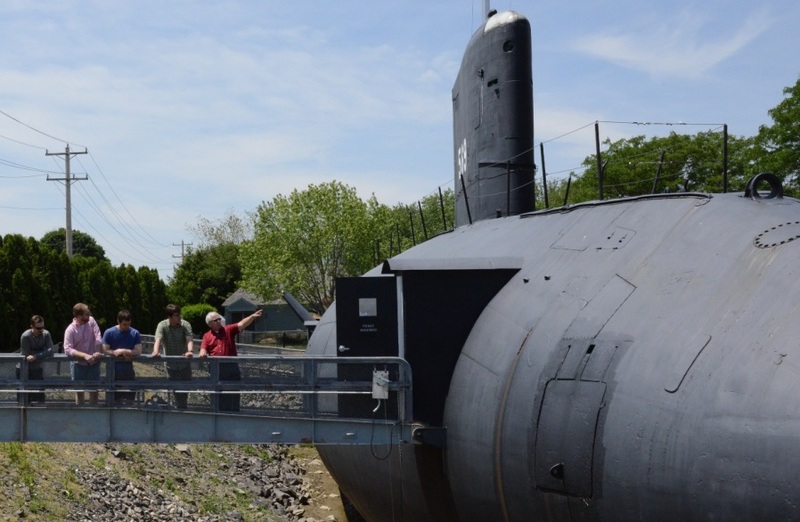 Wosnik and his graduate students met with Ken Herrick at Albacore Park for a personal tour of the sub, and to continue the “hunt” for a model that could be used in the tow tank or in a wind tunnel. Herrick, who started working at PNSY in 1959 when Albacore was in its Phase 2 stage, explained that the USS Albacore was developed by scientists and engineers at the US Navy’s David Taylor Model Basin (DTMB), which was unusual. The unconventional shape and lack of a deck was made palatable to Navy command admirals by pitching the project as a “fast target” that other submarines could hunt for practice. DTMB focused on the hydrodynamics and tested over 30 hull shapes, most of them as 9 ft wind tunnel models, to explore the effects of the shape of nose, hull, tail, and location of maximum diameter on overall drag. The “Barbel” class submarines were the first in‐service submarines based on the Albacore shape, and then the USS Skipjack first combined nuclear propulsion with the new hull shape, and the rest is history. For engineers to get a tour of the USS Albacore from someone who had worked on her was quite the experience. Also, the museum at Albacore Park actually has a beautifully executed 1:129 scale model in a showcase; unfortunately, this model was *not* available for wind tunnel testing! Ken Herrick had brought a set of the original blueprints for Albacore Phase 4 (more or less the way she is sitting in drydock at Albacore Park right now), and the filming was delayed by a couple of weeks, so a new plan was formulated: build a model from the original drawings. First, in a “mythbusters”‐type experiment in the UHH tow tank, Wosnik and graduate students debunked the legend that the US Navy towed “balloons” in a tank to come up with the optimal shape. It was later reconstructed that this legend likely had its origins in the fact that DTMB scientists based the initial Albacore candidate shapes on U.K. research on dirigibles, or airships (=“balloons”). Ph.D. candidate Pete Bachant brought the USS Albacore to life in a 3D model using section drawings on the old, difficult‐to‐read blueprints. Wosnik ordered 1:144 scale models of other submarines – a WWII German Type‐VII (think “Das Boot”), a Type XXI and the USS Seawolf, to be compared in experiments – and assembled them. Sheldon Parent rapid‐prototyped a 1:144 scale version of the Albacore on the M.E. 3D printer and fabricated mounting rods for the 18” x 18” (student) wind tunnel’s force balance. Ph.D. candidate Michael Allard put together a “USS Albacore” virtual instrument panel. John Turner and Allard helped with instrumentation. Ivo Nedyalkov, Ian Gagnon (who also assisted with the drawings) and Turner helped with experiments the day of the filming. “It was a team effort”, commented Wosnik “the most nerve-wracking moment was when I had to bake the model parts in our kitchen oven at low temperature for several hours to dry out the liquid from the solvent bath, so the model could be glued together.” The model was painted and first data with the drag balance was acquired just hours before the TV crew was due to arrive on June 21, 2015. The model test was tested approximately at 1:1000 dynamical scale (Reynolds number), accounting for differences in size, velocity and fluid viscosity (air vs. water). Due to the small model scale, drag coefficients measured were somewhat higher that for the full scale, but the data still showed about a threefold reduction drag coefficient when comparing the Albacore to a WWII submarine. It should also be noted that the blockage ratio was less than 3%, which is good, and that drag measurements were sensitive to alignment of the submarines. The support strut was not streamlined, and hence the drag on the support strut was a large fraction of the total drag measured. “Clearly, the models were too small to obtain accurate results. But we were able to show trends and demonstrate significant reduction in drag for the Albacore – good enough for TV,” said Wosnik. The show that TwoFour Broadcast was filming is titled “Impossible Engineering”, and it is broadcast in the U.S. on the Science channel. This subject of the episode is the British nuclear submarine HMS Astute, pride of the Royal Navy, with a brief segment explaining the origin of the HMS Astute’s shape and hydrodynamics via the USS Albacore. If you have questions about the Albacore model or the experiments, or are interested in obtaining an *.STL file to make you own model Albacore, please contact Prof. Martin Wosnik.